Trump made a lot of promises during the campaign. Our team wanted to create a way to show exactly how much of his promises he ended up keeping. We created a page where users can both see the percentage of promises that had been kept, broken, or were in some other status, and let users filter and sort individual promises to find out more information about them. This project made use of two libraries: Isotope and D3. They are relatively hefty libraries, so we needed to make sure users only downloaded what they needed and when they needed it. So, I made sure to only load in those libraries once this page was loaded. 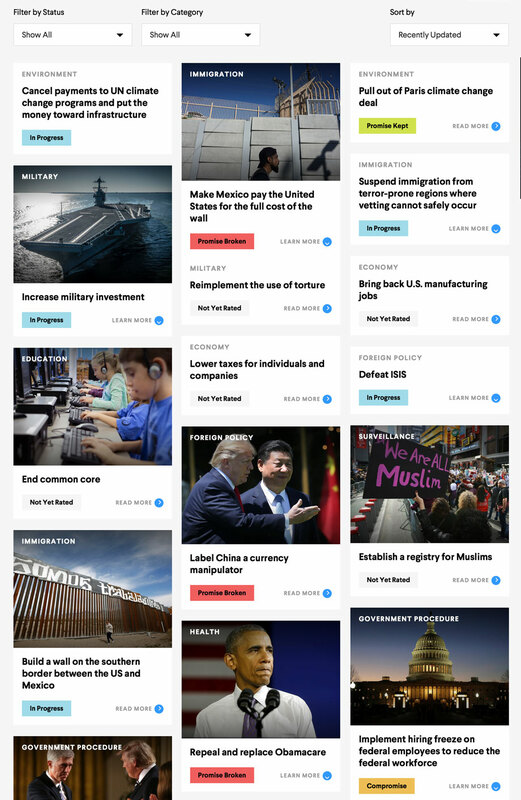 Editors kept track of the state of promises and updated them accordingly. 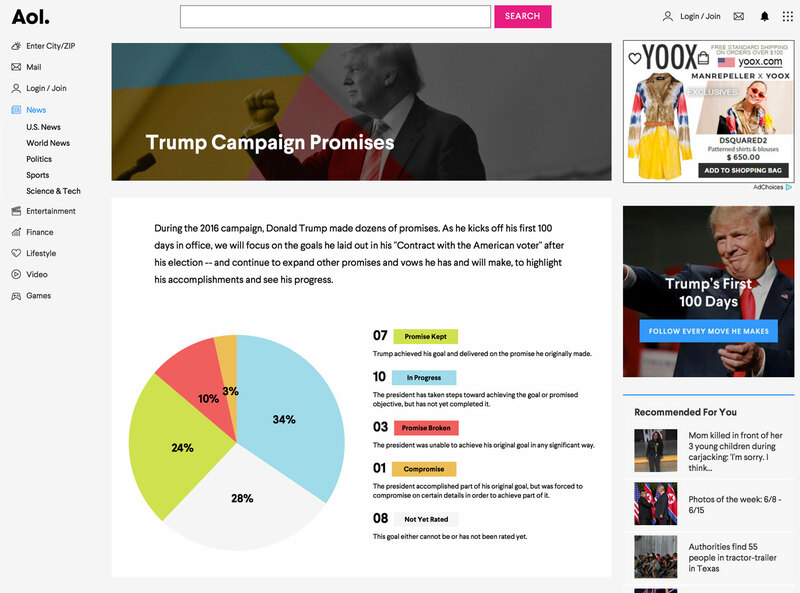 Users could filter the promises by category, status, and how recently updated they were. Isotope powered the filtering and sorting, and I used D3 to draw a pie chart showing the status of all promises at a glance. User experience was key to making this work. However, I was only given designs for desktop, and this needed to work for all devices. So, the design decisions made on mobile were all made by me. Using the design language already established in the desktop mockups, I made sure to keep the page hierarchy in a way that made sense for mobile. I learned to only load in what I needed, and to use the skills I had to get the job done. I have been given desktop designs and have created mobile designs from them many times, and a task like this is perfectly suited for my skillset.